How did you get your start in cycling and as a bike mechanic? Growing up in New England, my dad had some pretty nice Schwinn mountain bikes. This was back when Schwinn made higher end bikes. He did his fair share of riding, nothing super crazy but that really sparked my interest in the world of cycling. A bike was always part of my youth, whether it was to get around town, back and forth from school or just to head out and explore the dirt roads with friends. Through high school I played football and basketball though, so didn’t really get into racing and working on bikes until the end high school and into college. From then on, I knew I wanted to be involved with cycling and try to make a career out of it. How did you break into working as a professional mechanic? My start as a mechanic at the professional level was with Adam Myerson and his Nerac road team during the 2006 road season. It was a great experience and a confirmation for me that this was what I wanted to pursue. In Fall of 2006, I moved to Colorado and spent the winter living in the mountains. 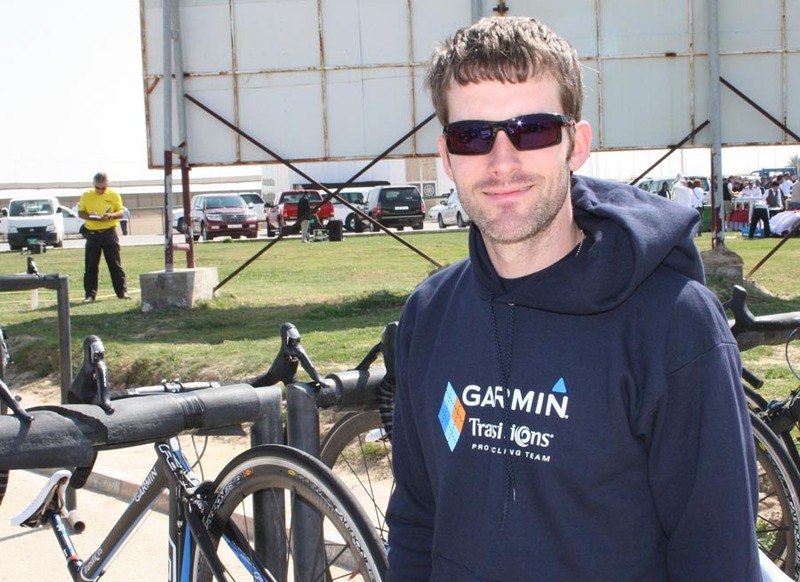 At the beginning of the 2007 season I got a call from Ben Turner, the Operations Manager for Slipstream Sports the management company for what is now the Garmin-Sharp Pro Cycling Team. They needed a second mechanic to help at the Tour de Georgia and I jumped at the opportunity. I had the chance to work with Daimeon Shanks, their mechanic at the time, and he really showed me the ropes that first year I worked for the team. We had some great times working the US circuit together. That following year I moved to Europe with the team and was based in Girona, Spain for 3 seasons working on the ProTour circuit. From there the rest is pretty much history. On the job at a USGP race. Photo from Bike Radar. Take me through a typical big race weekend. What’s your schedule, what work are you doing, etc? For a domestic race, I generally fly in on a Friday–mid-day or evening time, have team dinner, and then get a good night sleep. Saturday mornings start at 7:30am with staff breakfast at the best local spot we can find. I’m a breakfast fanatic and traveling around the country we get a great chance to find some seriously good breakfast gems. After breakfast, we head over to the venue for 8:30-9 arrival. We finish setting up camp and then dive into prepping bikes for the first of two course previews. Jeremy and the rest of the riders usually show up around 11 and get kitted up. Around noon, Jeremy and I have a discussion about tire selection and what pressure choice he is thinking about running that day. Over the past two years of working with Rapha-Focus, I’ve complied a spreadsheet of what the conditions have been at all of the US venues as well as what tires/pressures we went with. This information gives me a good starting point for equipment choices. After a preview of the course and depending on how much time J has gotten on the bike, we have a quick debrief and schedule a few more laps right before the women’s race. By now, the women are getting ready to start, Jeremy is getting into his pre-race routine and I’m going over last minute prep work on two or three race bikes depending on the conditions. 15 minutes before the race, I head up to the starting grid with a spare bike, wheels, and air gun just in case we need to make any last minute adjustments. I’ll usually map out my route to the pits from there. This gives me plenty of time to get there before the riders arrive on the first lap. Once the gun goes off and the race is on, this is where you really earn your pay check. Especially if the conditions are bad (cold, muddy, rainy, etc). Bike changes and washing are all part of the job during the next hour of racing. And also communicating time gaps if need be. After the race, its straight back to the camp to wash and prep for the next day. Sunday’s start is pretty much the same with less work in the morning but more work at night packing the truck after the weekend of racing. It is key to make sure all equipment is packed in the truck clean and bikes/wheels are addressed before their next race. The worst thing you can do is leave bikes and wheels dirty in the truck. Number one rule. Prepare now, not later. 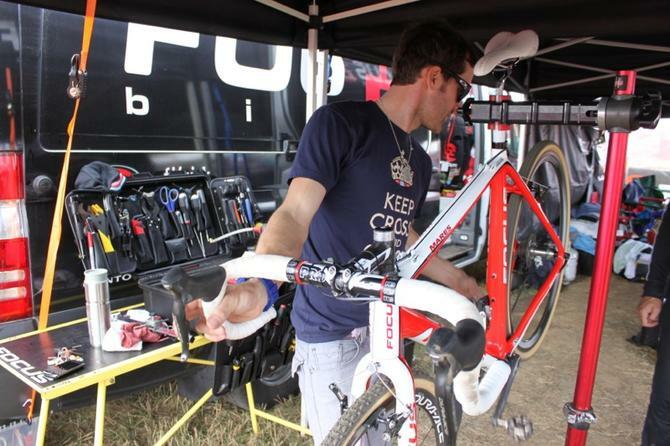 Similarly, what does a pro mechanic during the weeks between races? I’m lucky enough to be able to fly home to my family. My wife and I had a beautiful daughter last August so its really a blessing to be able to spend time with them between races. The team has a few mechanics that take turns driving the rig around the country. Hands down I think Rapha-Focus has one of the best support staffs domestically. During the week I also have a full time job working for a great bike shop in Boulder, Colorado. Colorado Multisport has given me amazing flexibility during the fall and winter to work for Rapha-Focus. Most of the work I need to do for the team and Jeremy is done when I’m on the road, but if new bikes need to be built or wheels need to be glued, that’s all done at my home in Colorado between races. It’s important to get things sorted during the week and have your focus on the racing during the weekend. Tom and Jeremy. Photo from Podium Insight. Racers always get asked about US vs Euro cross. What about for a mechanic? Is life in a European race pit vastly different than in the US? I think the biggest differences are resources and familiar faces when we work races in Europe. In the US, we have our full truck and trailer and everything we might need. When we travel to Europe we have to be smart about what we’re traveling with and make sure to pack efficiently. It’s also good to communicate with the rider about the possible course conditions and what he or she might need to be successful. Thats the key, having everything within reason for your rider. Keeping the stress level as low as possible. I don’t think the travel affects mechanics as much as it does the athletes. Its still all the same to me. If anything, I get less looks when power washing bikes in a self serve car wash in Belgium then I do washing a bike in front of my garage the US. Cycling is more common in Europe then the US, its everywhere there. Bike racing has allowed you to see a lot of the world. Do you have a favorite race you’ve worked? Hands down it was Paris-Roubaix. There isn’t anything else like it in pro cycling. When you work a classic like that in the ProTour its all hands on deck. That is the one race a year where all the staff are needed to work. You have 6-10 team cars all leapfrogging cobble sections just in case there are any mishaps. It’s truly amazing, so much history on those cobbles. Domestically I have such a soft spot in my heart for the Gloucester Cyclocross Grand Prix. Growing up in New England, that was always my favorite race to work and to race. Disc brakes were the newest thing in cross this year, but it seems like they’ll be standard equipment within another season or two. What do you think is going to be the next revolution in cyclocross technology? Disc ‘cross bikes are definitely trending right now. And now with SRAM’s new HydroR, I don’t see disc brakes going away anytime soon. But for the next big thing in cross, I think SRAM’s new XX1 can fill that slot. It would basically eliminate the concern of shifting in the front all together. It’s not a totally new concept though, because about 6 years ago, Todd Wells used this set up and was probably a bit ahead of his time. He made it cool and practical to run a 42 single with a guard. It was lighter and just simpler altogether. A 1 by 11 can field the same range as a 2 by 10 and makes a lot of sense for ‘cross. 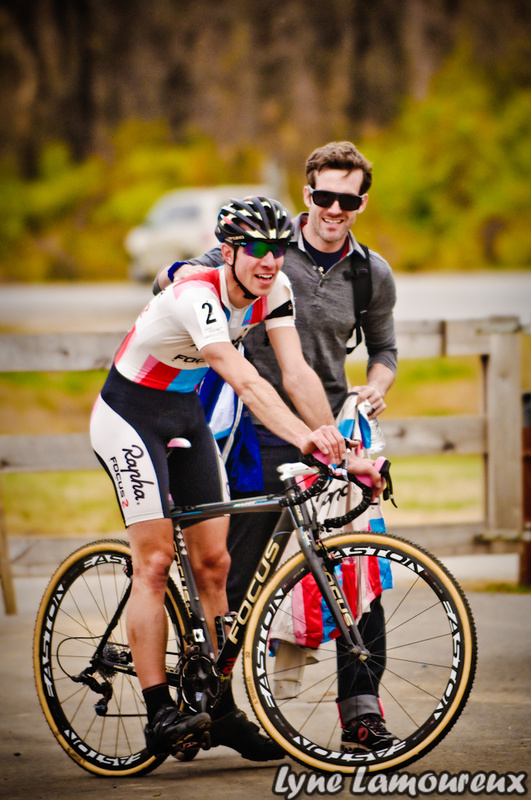 This entry was posted in Cyclocross, Interviews, Mechanics, Racing and tagged adam myerson, Cyclocross, garmin sharp, garmin slipstream, jeremy powers, jonathan page, louisville 2013, professional cycling mechanic, rapha focus, tom hopper, zach mcdonald. Bookmark the permalink.